Yes, it’s true! You can now get Rs. 6000* off on Apple iMac under exchange offer. You can exchange your old laptop, PC or even a TV to get the discount. Well, Rs. 6000 is not a huge discount on the iMac but something is better than nothing. So if you were planning to buy an iMac then go ahead and buy it now. 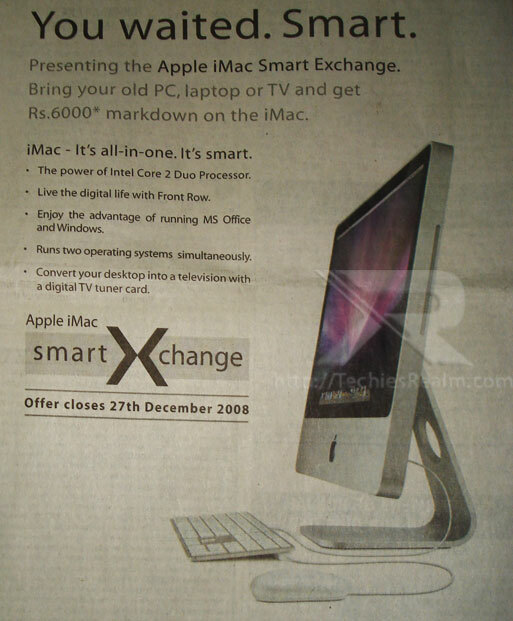 Apple advertisement in Hindustan Times (21-Nov-2008). Apologies for poor quality image. Already got an iMac under this offer? Post your experience in Comments. I came across this offer some months back when I visited an Apple re-seller and they had all sorts old PCs lying around the store, when I asked them they told me about the offer. Ok! i never knew about that. That might be an offer from the dealer. Anyway 6000 is not a big discount (well, it’s not actually discount) when you are spending that much amount.